Estates Gazette is pleased to present the features programme for 2017, investigating and reporting on key issues, sectors and geographical areas of the market. Below you can view the 2017 features programme, including synopses which are released several weeks before the publication date. All Estates Gazette supplements and sector features are available to download for free on the new Estates Gazette app for iPhone, iPad, Android smartphone and tablet. Welcome to Estates Gazette’s regional and sector features list for 2017. We have regional features every week in the magazine so we can be more responsive and timely and these will be topic-led rather than location-led. So, if there is a hot new office trend in Bristol, a masterplan launched for a regeneration project in Leeds, and an interesting shed investment deal that bucks the trend in the Midlands, then we will be covering them all in the same week. We are interested in trends and issues that are affecting or could potentially affect the market for good or bad, whether it is in Cornwall or Manchester, Edinburgh or Dover. We are interested in profiles and case studies – people or companies that are doing something different or innovative that our readers could learn from or need to know about. EG London will continue eight times a year and we have programme of sector supplements which will look at generic trends and issues across the UK. Ideas for topics, themes and trends for supplements should be submitted at least eight weeks ahead of the publication date. If you would like to suggest feature ideas to the editorial team, please contact egfeatures@estatesgazette.com. To book advertising, please contact us here. Click on the + where available to view the feature synopsis. The islanders weren’t eligible to vote in the referendum so how will the relationship with EU and the UK change post Brexit and what are the implications for property investment and development? Have you been involved in deal that you think has significance for the market? In the first instance send your suggestion with a couple of bullet points explaining why it is significant to Stacey.meadwell@estatesgazette.com One significant deal will be featured as part of the deals page. Somerset has Hinkley Point C but Anglesey could have Wylfa Newydd and a site at Trawsfynwydd near Porth Maddock has been proposed for the first advanced modular reactor will these projects power up the North Wales property and investment market? President elect Donald Trump is half Scottish, an investor in Scotland and apparently a ‘Scotophile’. Is the Trump presidency potentially a good thing for investment in Scotland? As much needed new supply launches into the Reading market how is the rest of the Thames Valley faring? A successful year for inward investment for Birmingham – is there more to come? Birmingham has substantially improved its retail and leisure and now Solihull has a 20-year regeneration plan – what role will it play within the city region? From ghost town to growth town? The Government has earmarked Nuneaton for 10,000 new homes over the next 10-15 years – what is the vision and strategy for making that happen and making it happen in a sustainable way? What’s happening in London’s restaurant scene? A record number of openings last year but pressure is mounting on some brands and concepts, we look at the emerging trends and what it takes to make it as an eatery in London. Is small-scale, specialist manufacturing the next growth sector in London particularly as local authorities look to support a wider variety of jobs in their boroughs? Please contact writers by Tues 24 Jan, 2017. Avonmouth docks is celebrating 140 years and is riding high on the back of a bumper year of industrial and distribution market activity but are the conditions set for fair this year? We lift the lid on this growing sector. An arena or stadium is much desired asset for any city but what are the wider economic benefits and how do you actually get one built? Have you been involved in deal that you think has significance for the market? In the first instance send your suggestion with a couple of bullet points explaining why it is significant to Stacey.meadwell@estatesgazette.com One significant deal will be featured as part of the deals page. Please note, you must be able to supply rent or price paid. As local authorities move closer towards taking control of their own finances we take a look at funding options for regeneration. Analysis of public sector property investment acquisitions – what is driving it and is it good for the market overall? A look at how technology is changing occupiers’ requirements and how sheds are shifted. Are mixed used ‘beds and sheds’ schemes the answer to making space for distribution in urban areas and could it become the norm? A look the growth and evolution of the modular housing manufacturing sector and its potential impact on the wider industrial market. A look at different retailers’ distribution and warehouse strategies for dealing with online and off-line sales and how that is impacting on the type and location of demand. Is building sheds underground a viable, mainstream alternative? The challenges of getting enough power to industrial and distribution space and how the industry is tackling it. Nice shed but can you get enough staff to work in it? With more and more occupiers basing location decisions on labour supply how will this impact on the shed market? Analysis of the regeneration project. Evolution of the club scene in Manchester and its impact on the leisure market. With Manchester and the north set to get additional funding from central Government as part of its industrial strategy, what does this mean for the sector and its property requirements. Clouds and silver linings - the outlook for the UK. Science, tech, creative and more, a look at growth areas and investment opportunities. Expansion, growth and connectivity – a look at the key opportunities being unlocked. What are the alternative ways of investing larger sums in residential aside from PRS and student housing? The importance of industrial and distribution as an investment class is growing – what do you need to know about the sector? London air pollution has reached levels worse than Beijing, could consolidation centres help by reducing van journeys and how much of a selling point are they for landlords? The rise of creatives and tech, the wobbles of financial services – what does the future look like for the City and City fringe? Crossrail trains will start running through Farringdon next year, the Museum of London has received a funding boost for a new building at West Smithfield – is the momentum building to finally realise the areas full potential? Please contact writers by Tues 14 Feb, 2017. What is the future for economic growth for Southampton? Does it have the right ingredients to attract, support and grow modern businesses? Coverage of EG’s Southampton Question Time will appear in this issue. Come along and join in the debate at Southampton Football Club on Mar 2, for more details, free registration and to pre-submit a question to the panel head to our events page. Analysis of regeneration and economic growth plans. Where’s mine? Co-working, creative hubs and funky offices are de rigueur for any successful metropolitan tech cluster – could smaller cities and conurbation benefit from such space and how viable are they? Analysis of the sector, requirements and demands. With the Government favouring cities and regions with devolution deals is Newcastle in danger of being left behind? How much growth has the sector got to go in Newcastle and beyond? Analysis of regeneration plans and strategy for economic growth in the historic city. Quality of air inside is just as important as outside and its increasingly on the agenda for occupiers when looking at offices. What are the implications for landlords and developers? What are the answers in the short, medium and long term and how will they impact on London’s real estate? Please contact writers by Monday 13 March, 2017. Where have all the big shopping centre development plans gone? A look at what is coming up and what might be coming up and what the next opportunities and trends for shopping centre development might be. Who’s in, who’s out in the game of shopping centre acquisitions. You buy a failing retail asset, give it some tender loving investment and sell on making a tidy profit. Easy? Apparently not, so how do you make it work? Has the coffee shop market reached saturation or is it evolving with different and unique offer? The traffic to online retail isn’t one way only, some e-tailers are setting up physical stores. Why and what challenges are they facing? Download EGi’s London Residential Market Analysis as we take a detailed look at the development market, analysing 15 years of researched data. If you’re not subscribing to the number one title in commercial property, you’re missing out. 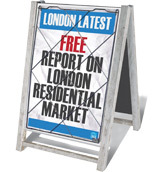 Subscribe to Estates Gazette today and receive essential market intelligence every week. Available in print, digital and on iPad.